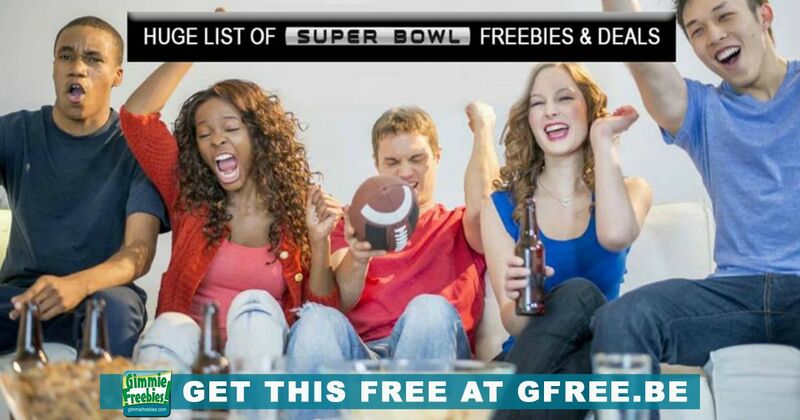 If you’re a football fan or not, then there are freebies to be scored for the super bowl. Super Bowl Sunday is February 3, 2019. It’s the second most watched sporting event in the world (it’s the most watched US event). The World Cup being the most watched sporting event worldwide. We compiled this roundup of free offers and special deals for Super Bowl 53. Enjoy! Got $5 Million dollars for running an ad on Super Bowl 2019? That’s what advertisers pay! The coldest Super Bowl took place in New Orleans. Buffalo Wild Wings is offering a free snack-sized order of Wings on February 18, if the big game goes into overtime. Order any burrito bowl and get all of the extras with this offer from Chipotle and Postmates. El Pollo Loco has a free Fire Grilled Chicken Nachos with purchase of any Family Meal on Big Game Sunday. Free sausage biscuit at Hardees, if a Pick 6 happens. Valid on February 8, 7 am to 10 am. Get a free two-topping pizza at Papa Johns for rewards members who spend at least $20 now through Sunday. Uber Rewards members in the losing city get a FREE ride home for 60 minutes after the Super Bowl 2019 game. Must be a Rewards Member for Uber’s Unhappy Hour Promotion. Game Day Pretzel Pack for $45 on Super Bowl Sunday from Auntie Anne’s Pretzels Select locations will give fans a free snack stadium holder when they purchase a pretzel pack. Baileys Sports Grille Deal! 50 bone-in wings, total price $35, Four pounds of boneless wings, total price $35. Pre-order by Saturday, February 2, 2019. Takeout only. Bertucci’s Restaurants has Game Day Takeout Deals! Pizza and Wing combos starting at $29.99. Boston Market has free delivery of catering orders of $100 or more now through Super Bowl Sunday. Get the coupon for free delivery special- CLICK HERE for your Boston Market coupon. If ordering online use promo code GAMEDELIVERY2019. Hickory Tavern has all you can eat wings during the Super Bowl for $19.95. Red Lobster get 10% off all party platter and To Go orders February 1 thru February 3. Get 20% off your dine-in check or takeout order on Super Bowl Sunday at Texas de Brazil. Show your server the Texas de Brazil web page to get the discount. Tijuana Flats is giving out a free Burro Bash with a catering order for 20 or more people on Super Bowl Sunday. Ask for “the Big Game Special ” to get the offer.